Currently running a RTL2832-based DVB-T (Digital TV) USB dongle (with R820T tuner) through software called RTL1090 to decode the ADS-B Mode-S packets that aircraft transmit on 1090MHz when interrogated by air traffic control radar. I'm running PlanePlotter locally to share data with other PlanePlotter users, and VirtualRadar Server to generate the map shown below. FR24 is being used to share my data with FlightRadar24.com website (shown on that site as T-EGPH4). This is running on a basic home-made vertical dipole antenna at my bedroom window for now. Click HERE (MOBILE) to open fullscreen. If you click the "Tracking x aircraft" link it'll list all aircraft logged today. Clicking on a registration or ICAO number will show all logged contacts with the aircraft since 10th January. The location of the aircraft on the map are shown by an X. The length of the stalk denotes the altitude with the aircraft at the top. Note that not all aircraft transmit their location all the time so there will be more in the list than shown on the map. Data refreshes every 3 seconds. 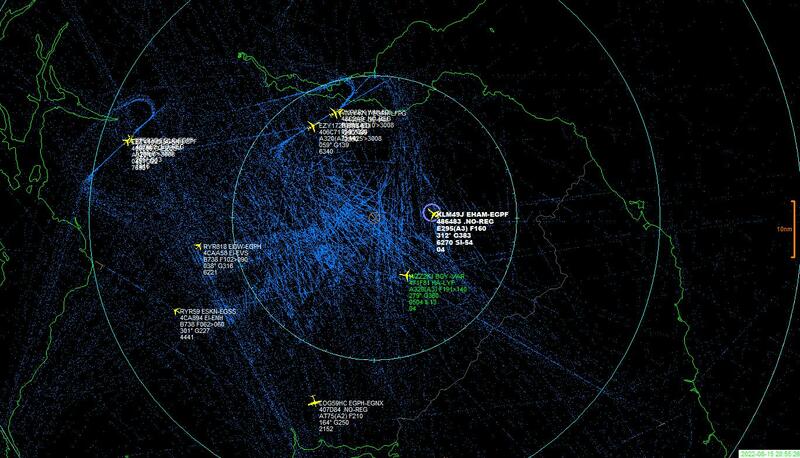 Blue dots are previous confirmed positions of aircraft detected (where they transmit coordinates). This gets cleared every time I move or refresh the map but gives an idea of frequently used flight paths and hold patterns. I have added shared aircraft from other PlanePlotter users. Ones with green text are detected by me, grey text are the shared ones.